Download "APPLYING to ENGLISH GRADUATE SCHOOL PROGRAMS Advice from Seattle Pacific University s English Department"
1 APPLYING to ENGLISH GRADUATE SCHOOL PROGRAMS Advice from Seattle Pacific University s English Department In this article: Is Graduate School Right for Me? What Career Opportunities Lie Beyond Graduate School? What Can I Expect in Graduate School? 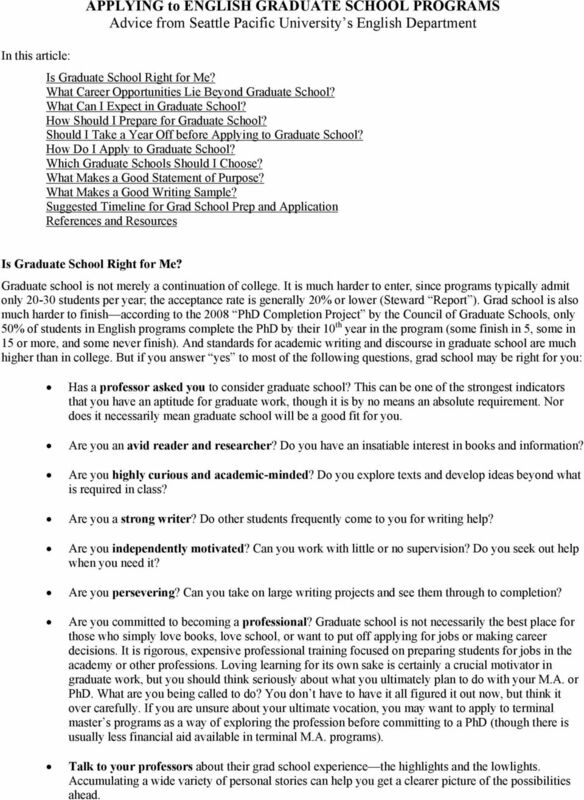 How Should I Prepare for Graduate School? Should I Take a Year Off before Applying to Graduate School? How Do I Apply to Graduate School? Which Graduate Schools Should I Choose? What Makes a Good Statement of Purpose? What Makes a Good Writing Sample? Suggested Timeline for Grad School Prep and Application References and Resources Is Graduate School Right for Me? Graduate school is not merely a continuation of college. It is much harder to enter, since programs typically admit only students per year; the acceptance rate is generally 20% or lower (Steward Report ). 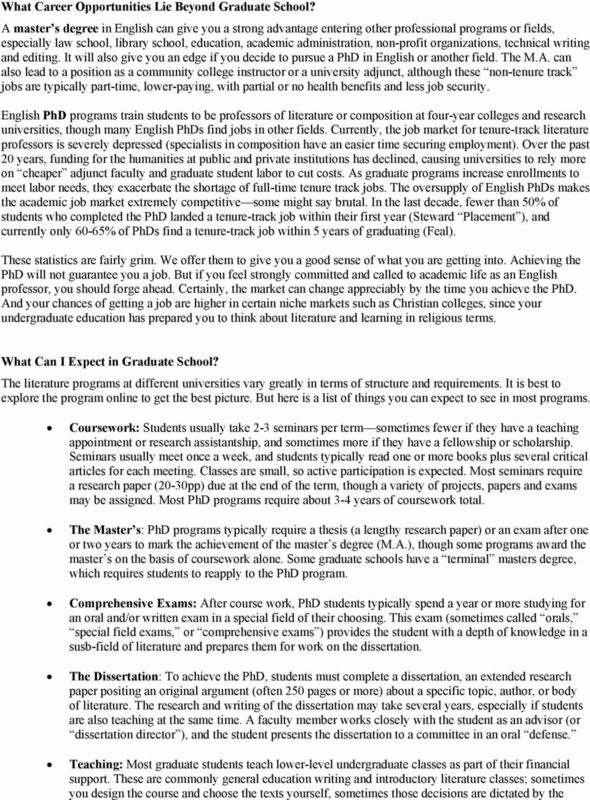 Grad school is also much harder to finish according to the 2008 PhD Completion Project by the Council of Graduate Schools, only 50% of students in English programs complete the PhD by their 10 th year in the program (some finish in 5, some in 15 or more, and some never finish). And standards for academic writing and discourse in graduate school are much higher than in college. But if you answer yes to most of the following questions, grad school may be right for you: Has a professor asked you to consider graduate school? This can be one of the strongest indicators that you have an aptitude for graduate work, though it is by no means an absolute requirement. Nor does it necessarily mean graduate school will be a good fit for you. Are you an avid reader and researcher? Do you have an insatiable interest in books and information? Are you highly curious and academic-minded? Do you explore texts and develop ideas beyond what is required in class? Are you a strong writer? Do other students frequently come to you for writing help? Are you independently motivated? Can you work with little or no supervision? Do you seek out help when you need it? Are you persevering? Can you take on large writing projects and see them through to completion? Are you committed to becoming a professional? Graduate school is not necessarily the best place for those who simply love books, love school, or want to put off applying for jobs or making career decisions. It is rigorous, expensive professional training focused on preparing students for jobs in the academy or other professions. Loving learning for its own sake is certainly a crucial motivator in graduate work, but you should think seriously about what you ultimately plan to do with your M.A. or PhD. What are you being called to do? You don t have to have it all figured it out now, but think it over carefully. If you are unsure about your ultimate vocation, you may want to apply to terminal master s programs as a way of exploring the profession before committing to a PhD (though there is usually less financial aid available in terminal M.A. programs). Talk to your professors about their grad school experience the highlights and the lowlights. Accumulating a wide variety of personal stories can help you get a clearer picture of the possibilities ahead. 3 department. You may also have the opportunity to teach film and upper division courses for majors. You may get an appointment as a teaching assistant to a professor (the professor lectures, you grade papers and lead discussion groups of students). Or you may get a research assistantship in which you do research for a senior professor. Or you might be able to apply for an undergraduate tutoring or administrative position. How Should I Prepare for Graduate School? Begin planning at the start of your junior year so that you can take the courses that will best prepare you for graduate school. 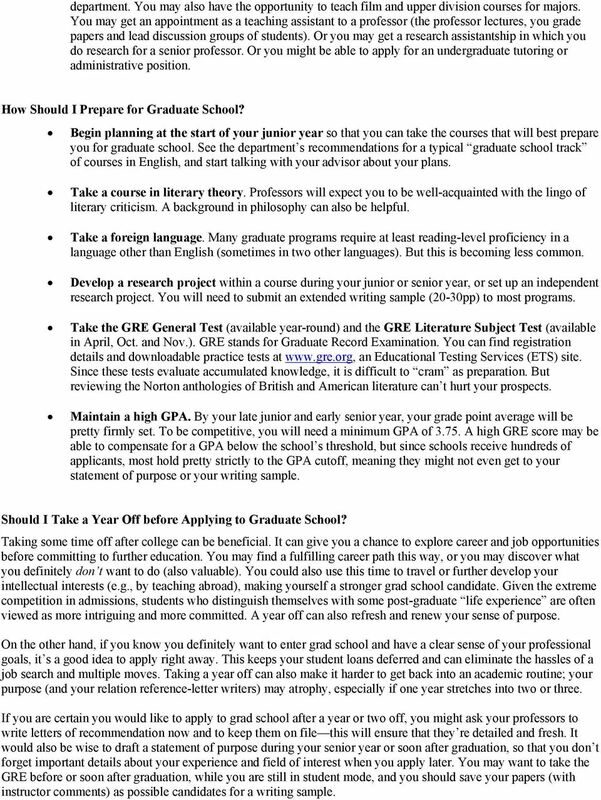 See the department s recommendations for a typical graduate school track of courses in English, and start talking with your advisor about your plans. Take a course in literary theory. Professors will expect you to be well-acquainted with the lingo of literary criticism. A background in philosophy can also be helpful. Take a foreign language. Many graduate programs require at least reading-level proficiency in a language other than English (sometimes in two other languages). But this is becoming less common. Develop a research project within a course during your junior or senior year, or set up an independent research project. You will need to submit an extended writing sample (20-30pp) to most programs. Take the GRE General Test (available year-round) and the GRE Literature Subject Test (available in April, Oct. and Nov.). GRE stands for Graduate Record Examination. You can find registration details and downloadable practice tests at an Educational Testing Services (ETS) site. Since these tests evaluate accumulated knowledge, it is difficult to cram as preparation. But reviewing the Norton anthologies of British and American literature can t hurt your prospects. Maintain a high GPA. By your late junior and early senior year, your grade point average will be pretty firmly set. 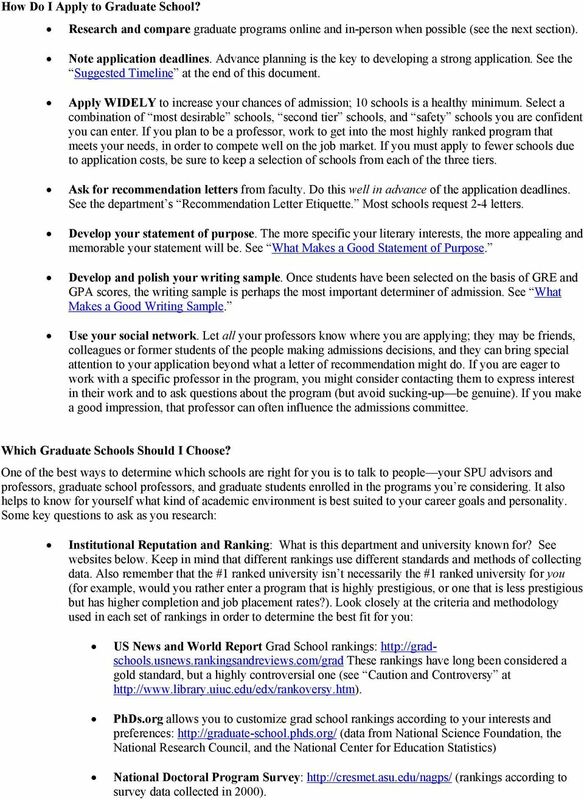 To be competitive, you will need a minimum GPA of A high GRE score may be able to compensate for a GPA below the school s threshold, but since schools receive hundreds of applicants, most hold pretty strictly to the GPA cutoff, meaning they might not even get to your statement of purpose or your writing sample. Should I Take a Year Off before Applying to Graduate School? Taking some time off after college can be beneficial. It can give you a chance to explore career and job opportunities before committing to further education. You may find a fulfilling career path this way, or you may discover what you definitely don t want to do (also valuable). You could also use this time to travel or further develop your intellectual interests (e.g., by teaching abroad), making yourself a stronger grad school candidate. Given the extreme competition in admissions, students who distinguish themselves with some post-graduate life experience are often viewed as more intriguing and more committed. A year off can also refresh and renew your sense of purpose. On the other hand, if you know you definitely want to enter grad school and have a clear sense of your professional goals, it s a good idea to apply right away. This keeps your student loans deferred and can eliminate the hassles of a job search and multiple moves. Taking a year off can also make it harder to get back into an academic routine; your purpose (and your relation reference-letter writers) may atrophy, especially if one year stretches into two or three. If you are certain you would like to apply to grad school after a year or two off, you might ask your professors to write letters of recommendation now and to keep them on file this will ensure that they re detailed and fresh. It would also be wise to draft a statement of purpose during your senior year or soon after graduation, so that you don t forget important details about your experience and field of interest when you apply later. 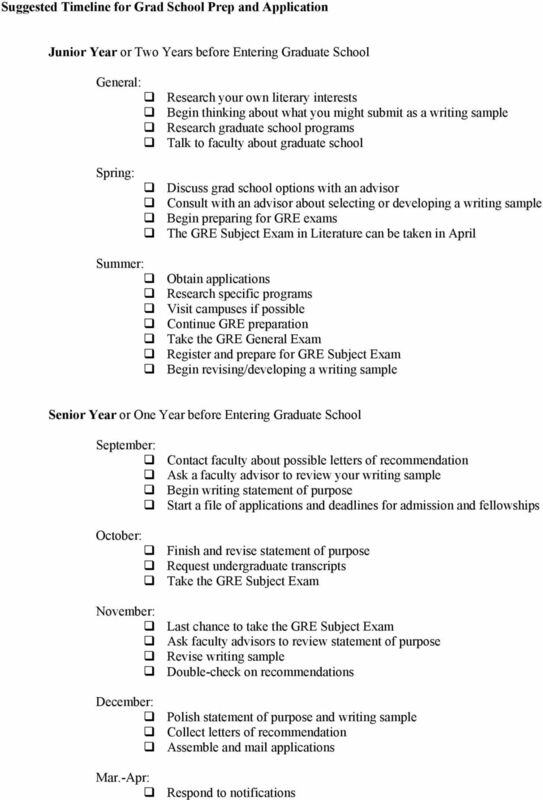 You may want to take the GRE before or soon after graduation, while you are still in student mode, and you should save your papers (with instructor comments) as possible candidates for a writing sample. 4 How Do I Apply to Graduate School? Research and compare graduate programs online and in-person when possible (see the next section). Note application deadlines. Advance planning is the key to developing a strong application. See the Suggested Timeline at the end of this document. Apply WIDELY to increase your chances of admission; 10 schools is a healthy minimum. Select a combination of most desirable schools, second tier schools, and safety schools you are confident you can enter. If you plan to be a professor, work to get into the most highly ranked program that meets your needs, in order to compete well on the job market. If you must apply to fewer schools due to application costs, be sure to keep a selection of schools from each of the three tiers. Ask for recommendation letters from faculty. Do this well in advance of the application deadlines. 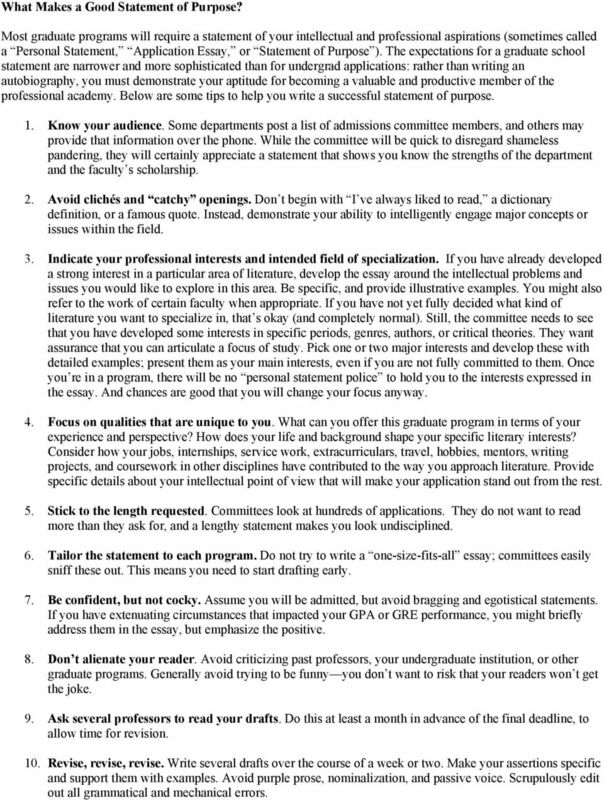 See the department s Recommendation Letter Etiquette. Most schools request 2-4 letters. Develop your statement of purpose. The more specific your literary interests, the more appealing and memorable your statement will be. See What Makes a Good Statement of Purpose. Develop and polish your writing sample. Once students have been selected on the basis of GRE and GPA scores, the writing sample is perhaps the most important determiner of admission. See What Makes a Good Writing Sample. Use your social network. Let all your professors know where you are applying; they may be friends, colleagues or former students of the people making admissions decisions, and they can bring special attention to your application beyond what a letter of recommendation might do. If you are eager to work with a specific professor in the program, you might consider contacting them to express interest in their work and to ask questions about the program (but avoid sucking-up be genuine). If you make a good impression, that professor can often influence the admissions committee. Which Graduate Schools Should I Choose? One of the best ways to determine which schools are right for you is to talk to people your SPU advisors and professors, graduate school professors, and graduate students enrolled in the programs you re considering. It also helps to know for yourself what kind of academic environment is best suited to your career goals and personality. Some key questions to ask as you research: Institutional Reputation and Ranking: What is this department and university known for? See websites below. Keep in mind that different rankings use different standards and methods of collecting data. Also remember that the #1 ranked university isn t necessarily the #1 ranked university for you (for example, would you rather enter a program that is highly prestigious, or one that is less prestigious but has higher completion and job placement rates?). Look closely at the criteria and methodology used in each set of rankings in order to determine the best fit for you: US News and World Report Grad School rankings: These rankings have long been considered a gold standard, but a highly controversial one (see Caution and Controversy at PhDs.org allows you to customize grad school rankings according to your interests and preferences: (data from National Science Foundation, the National Research Council, and the National Center for Education Statistics) National Doctoral Program Survey: (rankings according to survey data collected in 2000). 5 The Center for Measuring University Performance: (ranked yearly) Faculty Specialties and Experience: Who s teaching here, and would I want to work with them? 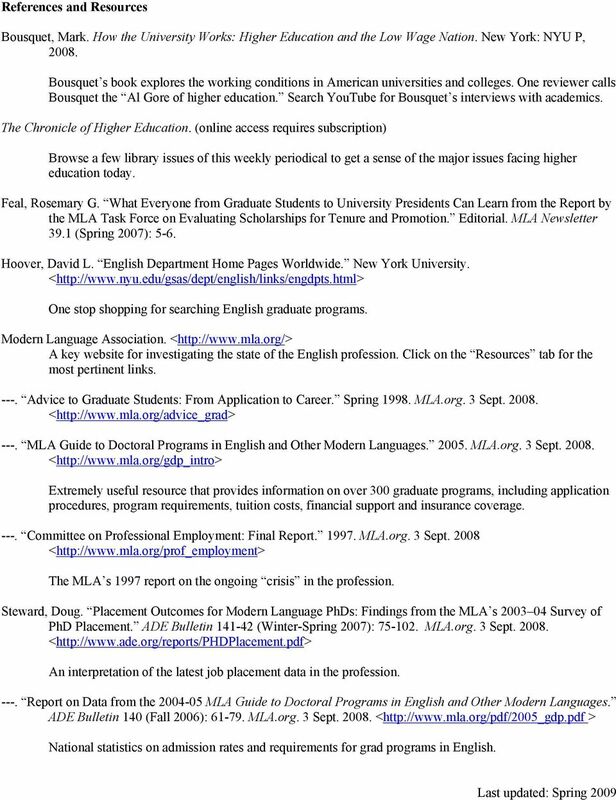 Look up professor names on the university website, and then do an MLA search to get a sense of their scholarship interests; or if you have read some criticism that interested you, search for the scholar s institution. What are the strengths of the program (18 th -century British? post-modern theory? composition studies?) If you know what you want to specialize in, it makes sense to seek out departments that are strong in this area; if you re not sure what your focus will be, you might decide on a program that has depth in a broad range of literature specialties. Also consider the age-distribution of the faculty; older faculty often have a treasure-trove of expertise, while younger faculty are often at the forefront of new movements in literary criticism (of course, the reverse can be true as well). Program Structure: What are the various stages of the program? Is there a terminal M.A., or is the Master s awarded as the first stage of PhD completion? Is there an M.A. thesis, M.A. exam, or both? 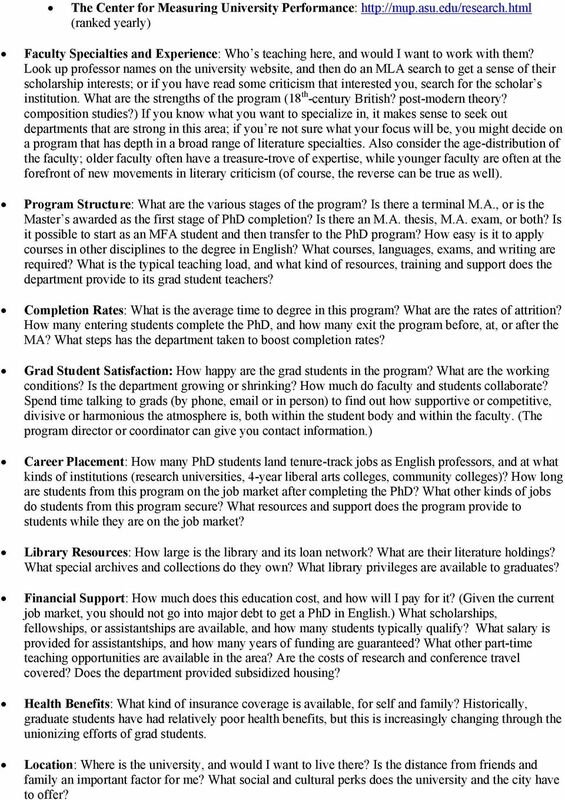 Is it possible to start as an MFA student and then transfer to the PhD program? How easy is it to apply courses in other disciplines to the degree in English? What courses, languages, exams, and writing are required? What is the typical teaching load, and what kind of resources, training and support does the department provide to its grad student teachers? Completion Rates: What is the average time to degree in this program? What are the rates of attrition? How many entering students complete the PhD, and how many exit the program before, at, or after the MA? What steps has the department taken to boost completion rates? Grad Student Satisfaction: How happy are the grad students in the program? What are the working conditions? Is the department growing or shrinking? How much do faculty and students collaborate? Spend time talking to grads (by phone, or in person) to find out how supportive or competitive, divisive or harmonious the atmosphere is, both within the student body and within the faculty. (The program director or coordinator can give you contact information.) Career Placement: How many PhD students land tenure-track jobs as English professors, and at what kinds of institutions (research universities, 4-year liberal arts colleges, community colleges)? How long are students from this program on the job market after completing the PhD? What other kinds of jobs do students from this program secure? What resources and support does the program provide to students while they are on the job market? Library Resources: How large is the library and its loan network? What are their literature holdings? What special archives and collections do they own? What library privileges are available to graduates? Financial Support: How much does this education cost, and how will I pay for it? (Given the current job market, you should not go into major debt to get a PhD in English.) What scholarships, fellowships, or assistantships are available, and how many students typically qualify? What salary is provided for assistantships, and how many years of funding are guaranteed? What other part-time teaching opportunities are available in the area? Are the costs of research and conference travel covered? Does the department provided subsidized housing? Health Benefits: What kind of insurance coverage is available, for self and family? Historically, graduate students have had relatively poor health benefits, but this is increasingly changing through the unionizing efforts of grad students. Location: Where is the university, and would I want to live there? Is the distance from friends and family an important factor for me? What social and cultural perks does the university and the city have to offer? 6 What Makes a Good Statement of Purpose? Most graduate programs will require a statement of your intellectual and professional aspirations (sometimes called a Personal Statement, Application Essay, or Statement of Purpose ). The expectations for a graduate school statement are narrower and more sophisticated than for undergrad applications: rather than writing an autobiography, you must demonstrate your aptitude for becoming a valuable and productive member of the professional academy. Below are some tips to help you write a successful statement of purpose. 1. Know your audience. Some departments post a list of admissions committee members, and others may provide that information over the phone. While the committee will be quick to disregard shameless pandering, they will certainly appreciate a statement that shows you know the strengths of the department and the faculty s scholarship. 2. Avoid clichés and catchy openings. Don t begin with I ve always liked to read, a dictionary definition, or a famous quote. Instead, demonstrate your ability to intelligently engage major concepts or issues within the field. 3. Indicate your professional interests and intended field of specialization. If you have already developed a strong interest in a particular area of literature, develop the essay around the intellectual problems and issues you would like to explore in this area. Be specific, and provide illustrative examples. You might also refer to the work of certain faculty when appropriate. If you have not yet fully decided what kind of literature you want to specialize in, that s okay (and completely normal). Still, the committee needs to see that you have developed some interests in specific periods, genres, authors, or critical theories. They want assurance that you can articulate a focus of study. Pick one or two major interests and develop these with detailed examples; present them as your main interests, even if you are not fully committed to them. Once you re in a program, there will be no personal statement police to hold you to the interests expressed in the essay. And chances are good that you will change your focus anyway. 4. Focus on qualities that are unique to you. What can you offer this graduate program in terms of your experience and perspective? How does your life and background shape your specific literary interests? Consider how your jobs, internships, service work, extracurriculars, travel, hobbies, mentors, writing projects, and coursework in other disciplines have contributed to the way you approach literature. Provide specific details about your intellectual point of view that will make your application stand out from the rest. 5. Stick to the length requested. Committees look at hundreds of applications. They do not want to read more than they ask for, and a lengthy statement makes you look undisciplined. 6. Tailor the statement to each program. Do not try to write a one-size-fits-all essay; committees easily sniff these out. This means you need to start drafting early. 7. Be confident, but not cocky. Assume you will be admitted, but avoid bragging and egotistical statements. If you have extenuating circumstances that impacted your GPA or GRE performance, you might briefly address them in the essay, but emphasize the positive. 8. Don t alienate your reader. Avoid criticizing past professors, your undergraduate institution, or other graduate programs. Generally avoid trying to be funny you don t want to risk that your readers won t get the joke. 9. Ask several professors to read your drafts. Do this at least a month in advance of the final deadline, to allow time for revision. 10. Revise, revise, revise. Write several drafts over the course of a week or two. Make your assertions specific and support them with examples. Avoid purple prose, nominalization, and passive voice. Scrupulously edit out all grammatical and mechanical errors. 7 What Makes a Good Writing Sample? The writing sample is perhaps the most crucial part of your application. It demonstrates your ability to articulate and sustain an original argument; your research skills; your writing aptitude and fluency; your intellectual maturity, creativity, and insight; and your familiarity with issues in the field of literature. Strong papers usually present close reading skills situated within a larger historical or theoretical framework. Below are some tips to help you develop a successful writing sample. 1. Consult your advisor on which paper to send. Bring a selection of your strongest papers and work together on selecting the best candidate. 2. 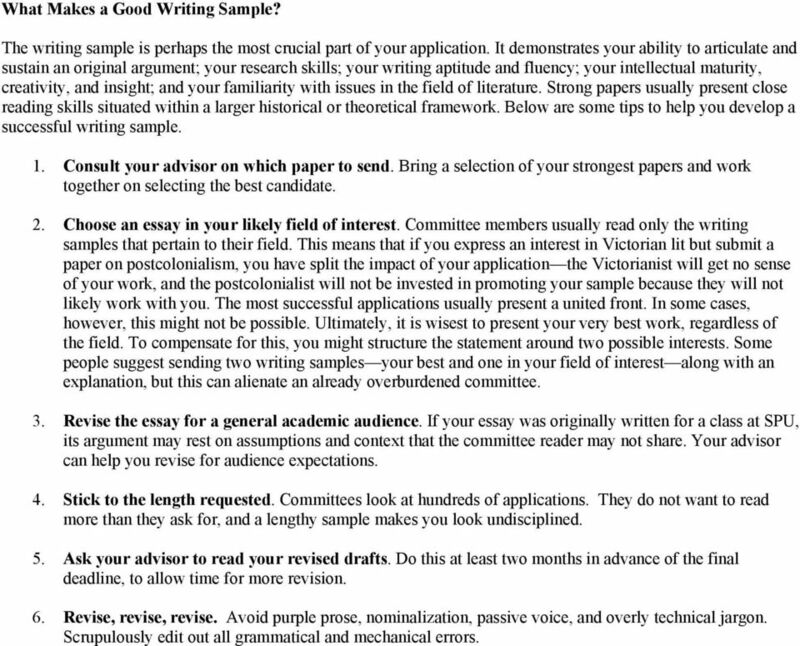 Choose an essay in your likely field of interest. Committee members usually read only the writing samples that pertain to their field. This means that if you express an interest in Victorian lit but submit a paper on postcolonialism, you have split the impact of your application the Victorianist will get no sense of your work, and the postcolonialist will not be invested in promoting your sample because they will not likely work with you. The most successful applications usually present a united front. In some cases, however, this might not be possible. Ultimately, it is wisest to present your very best work, regardless of the field. To compensate for this, you might structure the statement around two possible interests. Some people suggest sending two writing samples your best and one in your field of interest along with an explanation, but this can alienate an already overburdened committee. 3. Revise the essay for a general academic audience. If your essay was originally written for a class at SPU, its argument may rest on assumptions and context that the committee reader may not share. Your advisor can help you revise for audience expectations. 4. Stick to the length requested. Committees look at hundreds of applications. They do not want to read more than they ask for, and a lengthy sample makes you look undisciplined. 5. Ask your advisor to read your revised drafts. Do this at least two months in advance of the final deadline, to allow time for more revision. 6. Revise, revise, revise. Avoid purple prose, nominalization, passive voice, and overly technical jargon. Scrupulously edit out all grammatical and mechanical errors. Take Action to Begin Career Connections Today!